Patriarch Emmanuel III Delly together with all of the Chaldean bishops condemn this barbarous murder of the priest and his three deacons, massacred yesterday in Mosul after Sunday Mass: “A horrible crime against God and humanity , may these martyrs find eternal rest”. This afternoon the funerals will be held in Karamles. New information comes to light surrounding the murders. Mosul (AsiaNews) – With “a heart full of bitterness and mourning”, the Chaldean Church is today lamenting its martyrs. This is how, in a joint statement the Chaldean Patriarch and his bishops remember Fr Ragheed Ganni (in the photo) and his three sub-deacons - Basman Yousef Daud, Wahid Hanna Isho, Gassan Isam Bidawed – murdered in cold blood yesterday, as they left the Parist Church of the Holy Spirit in Mosul after Sunday Mass. This afternoon at 15.00 (local time) their funerals will be held in Karamles, Fr. Ragheed’s home town; celebrated by Msgr. Faraj Rahho, the bishop of Mosul. Emmanuel III Delly’s condemnation on behalf of the nation’s bishops came just hours after the assassination. “It is a most heinous crime that any person of proper conscience would reject. The authors carried out a most horrible act against God, against humanity, against their own brothers who were peace loving citizens, as well as men of religion who always offered their prayers to God the Almighty for security and stability in Iraq”, the text reads. Msgr. Rabban al Qas, bishop of Amadiyah and Erbil, reflected on the figure of Fr. Ragheed with AsiaNews: “He had such great courage, united with a loving calm. He was a spiritual man, loved by his people, Catholic and Muslim”. Meanwhile new information surrounding the nature of the attack has come to light. After celebrating Sunday mass, Fr Ragheed and his three aides were leaving the Parish by car, accompanied by the wife of one of the sub-deacons,, Gassan Isam Bidawed. In recent days the three insisted on accompanying Fr Ragheed to protect him. “They were young men alive with faith, who accompanied their parish priests every more, risking their lives for their belief in Christ”, their friends tell. Suddenly, at the corner of the road, their car is blocked by unknown armed men militants who order the woman to distance herself from the others and then, in cold blood, shoot the remaining passengers, repeatedly. The aggressor’s then booby trapped the car with explosives; with the aim of further carnage should anyone near the car to recover the bodies. In the immediate aftermath of the attack, the bodies remained, abandoned on the city street, because no one dared to approach. It was only towards ten pm (Local time) that security forces finally defused the explosives allowing corpses to be recovered. They now lie in repose in the Church of the Holy Spirit. The Chaldean bishops who are currently gathered for their patriarchal Synod “ask the Lord to grant mercy to the souls of these martyrs, and extend their deepest sympathies to the families of the deceased, to the bishop of the city Msgr. Faraj Rahho, to the brother priests of the victims and the Chaldean faithful throughout the world, that they may be given the necessary strength to face such an arduous situation”. The bishops conclude by recalling the persecution of Iraqi Christians, their forced emigration, their being pushed to renounce their faith asking “Iraqi leaders and international organisations to intervene to put a concrete end to these criminal acts”. Yesterday card. Tarcisio Bertone, Vatican secretary of state revealed that the war in Iraq will be on the agenda for talks with US President George Bush in his upcoming visit to Rome June 8th. Fr. 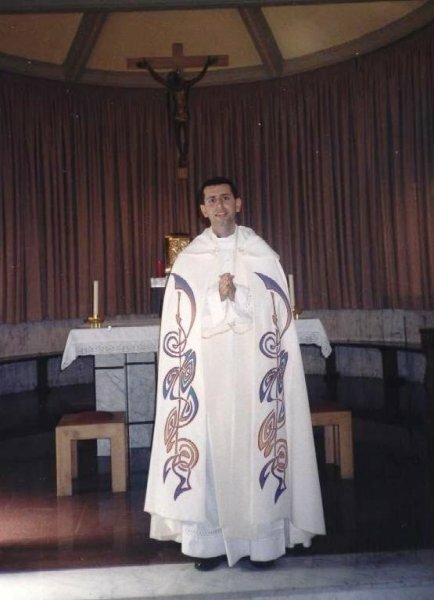 Ragheed is the first Catholic priest to have been killed in Iraq since 2003. Before him, last year it was the turn of a Syro- Orthodox priest Fr. Paul Iskandar. A dear friend of AsiaNews, Fr Ragheed Ganni was born in Mosul in 1972. A graduate in engineering form the local university, he studied theology from 1996 to 2003 at the Pontifical Irish College and the Pontifical University of Thomas Aquinas the "Angelicum", where he received a licence in Ecumenical Theology.